I NEVER really do this! Looking over my tag list for ideas I realized I need a follow-up to 'Binge on Fringe- Season 1', now that I've recently finished Fringe Season 2. Thanks, as ever, to Ron for providing me with these things to watch. Yes, I'm still hooked. No, I still don't like anybody. The stiff, dead-inside FBI gal, the unshaven jerk and his appalling father- or IS he? Spoilers abound in EVERYTHING I might say here, so I don't know how to go about this, but I can tell you I enjoyed the episodes called August, Peter, Jacksonville, White Tulip, Brown Betty, and Over There the most this season. But I am forced to admit the writing and performances are TOP-NOTCH. I feel fans of ordinary mysteries and horrors who can suspend their disbelief slightly would be more pleased than I am. 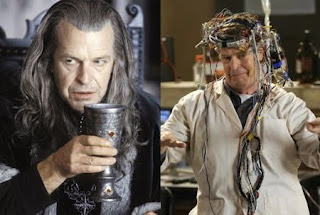 Do you know, I didn't realize the guy who plays Walter Bishop (John Noble) played Denethor in the Lord of the Rings movies until today? He's different kinds of horrible madmen in both, fascinating to watch, like some cobra in human form. One of my favourite bits was opening credits redone for a 1985 episode. I'll be watching the remainder of season 3 as it airs. You got me, Ron! Like it or not. You should check outside for flying pigs as well: I'm giving the V-make another chance tonight, too. My Favourite Characters: YER FATHER'S MUSTACHE! I write and draw now and then.